The patient with previous abdominal surgery is at higher risk for visceral and vascular injuries during Veress needle and initial trocar insertion (1). In the setting of previous surgery, an extraperitoneal/retroperitoneal approach can be undertaken. Urologic organs are well suited for this approach despite the more confined working space. Kidney, adrenal, ureteral, and prostate surgeries have all been described and successfully performed with the extraperitoneal approach. Alternatively, pneumoperitoneum can be created with a Veress needle that is inserted at least 3 cm away from previous abdominal incisions. If pneumoperitoneum is obtained with Veress needle, insertion of the primary port is preferably performed with an optical trocar (Optiviewa or Visiportb). 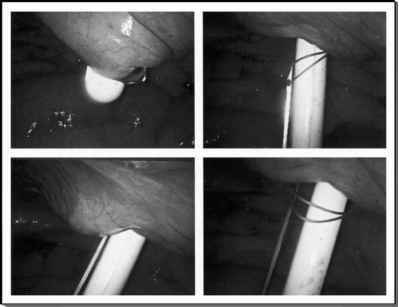 Abdominal adhesions are more pronounced after bowel surgery and complex reconstructive procedures, particularly in the event of anastomotic leaks. Prior abdominal or pelvic radiation is a major risk factor for adhesion formation due to chronic ischemia, and excessive care should be taken throughout these cases to prevent bowel injuries. A previous abdominal surgery is not an absolute contraindication for laparo-scopic procedures.